Stephen Wrenn recorded three knocks Thursday night and has hit safely in six of seven games this season. AMARILLO - Buddy Reed belted two home runs, including an inside-the-parker, and his Sod Poodles scored seven times in the third inning Thursday night en route to a 10-8 victory over Corpus Christi before 5,329 fans in the series opener at Hodgetown. 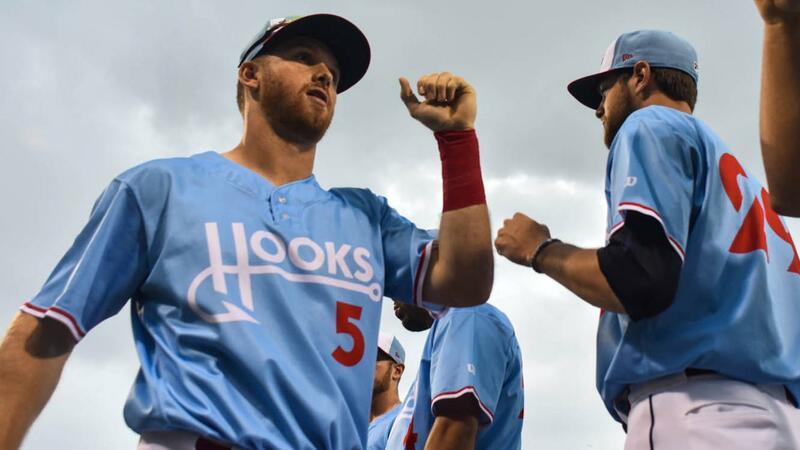 The Hooks (3-5), who trailed 8-0 through the first four innings, sent nine men to bat in the ninth. Blake Rogers issued walks to Ronnie Dawson and Chas McCormick to begin the inning. Stephen Wrenn was next and sent a triple into the right-field corner, turning a 10-5 contest into a three-run Amarillo lead. Josh Rojas made the score 10-8 with an RBI single in the next at-bat. Chuckie Robinson's base hit put the tying run on with no outs. Rogers fought back, generating a strikeout and a pop up before plunking Anibal Sierra. With the bases full, Osvaldo Duarte skied out to end the game. Corpus Christi scored its first two markers in the fifth, running eight men to the plate. McCormick's RBI single highlighted the rally. Robinson's lead-off home run in the sixth, his second blast in a three-game stretch, cut the visitor's deficit to five. Reed, who swatted a three-run clout in the third, opened the sixth with a deep drive to straightaway center field. They fly ball turned around Dawson and the ball landed at the base of the fence, allowing Reed to sprint around the bases for his fourth home run of 2019. Amarillo (3-5) scored twice in the frame. The Hooks notched a pair of runs in the eighth against Andres Munoz. Robinson and Carmen Benedetti came around to score on a Lorenzo Quintana base hit and an error by right-fielder Edward Olivares. Jose Bravo was the highlight on the hill for Corpus Christi. Bravo, making his Double-A debut, dispatched seven of the final eight men he faced. Wrenn recorded three knocks on the night and has hit safely in six of seven games this season. Tyler Ivey (0-0, 2.25) is slated to pitch for the Hooks Friday night. First pitch 7:05.